I’ve always harboured a secret desire to be a Bond girl. I fear I’m a little old in the tooth these days for aspiring to that kind of shenanigans (not to mention my unabashed fondness for food might make it a little tough fitting into the bikini) but hey, a girl can dream! One thing I can do however is have a play with OPI’s very cool new collection in celebration of 50 years of James Bond, called Skyfall after the super series’ latest instalment. Inspired by the films’ “blend of glamour and danger”, it features 12 limited edition shades that include metallic and glitter finishes, jewel tones and even a very cool jet black. Bond girl Bérénice Marlohe (above) even sports an OPI manicure in the film – Skyfall, a rich maroon, painted on top of the nail and GoldenEye, a shimmering gold, painted on the undersides. Pretty fabulous, huh? The Skyfall collection features six shades that play off the movie’s seductive theme, and another six that offer a more dangerous look. 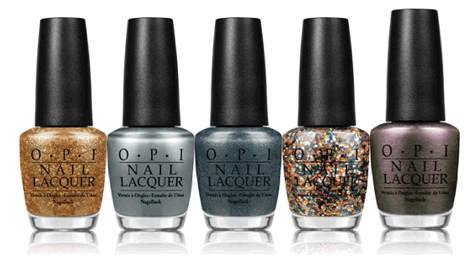 My picks are the aforementioned GoldenEye, Casino (a high rolling plum that would be perfect for toes), Moonraker (a metallic grey) and Live & Let Die, described fabulously as a “private jet” black. But that’s not all! As an extra treat, OPI have released an 18-karat gold leaf topcoat (RRP $74.00) called The Man with the Golden Gun after the legendary film of the same name. A luminous, rich topcoat, it adds an additional layer of chic gold leaf texture whether painted over completely dry OPI nail lacquer or directly to the nail itself. Love a bit of luxe in my life – especially when it’s affordable!